It's often mistaken for a honey bee. 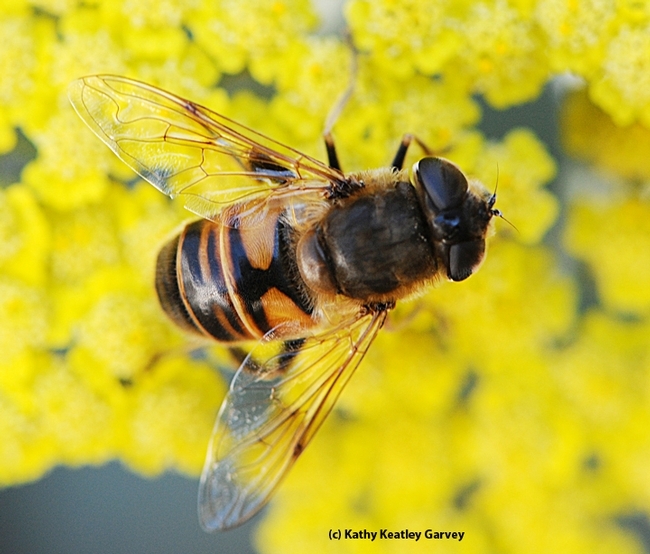 Indeed, to the untrained eye, the drone fly (Eristalis tenax) appears to be a bee. It's not; it's a fly. Native pollinator specialist Robbin Thorp, emeritus professor of entomology at UC Davis, calls the drone fly "The H Bee." That's because there's an "H" on its abdomen (see photo). Like all flies, however, it can be distinguished by one pair of wings and stubby antennae. The larva of the fly is a rat-tailed maggot that lives in drainage ditches, pooled manure piles and other polluted water. The adults are floral visitors. Pollinators. The "H Bee" was among the pollinators that Thorp discussed at the UC Davis Pollinator Gardening Workshop, hosted March 6 by the California Center for Urban Horticulture. Extension apiculturist Eric Mussen of the UC Davis Department of Entomology and Nematology, switched from bee mimics (drone flies, syrphid flies and other insects) to talk about the "real" honey bees, Apis mellifera, which European colonists introduced to what is now the United States in 1622. "The honey bees' biggest problem today is malnourishment," he said. "A single honey bee colony requires an acre of bloom to meet its nutritional needs each day," he said. The queen can lay 2000 eggs a day in peak season. "One cell of honey and one cell of pollen make one bee." He urged the participants to "try to plant for late summer and fall bloom, when honey bees in California are having a hard time finding nectar and pollen resources." 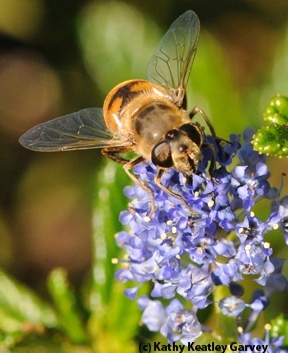 Particularly attractive to bees are manzanita species, Eucalyptus trees, catalpa, basswood, tulip tree, wild mustard and radish, ceanothus (wild lilac) and ornamental shrubs such as lavender, rosemary and thyme. Also, borage, sunflower, asters, catmint and other mints, chives, filaree, vetch, tarweed, goldenrod, blue curls (Trichostema lanceolatum), phacelia and penstemon. Pesticides inside the hive (used to control varroa mites) and outside the hives can be fatal. However, he said, "any kind of pesticide a bee encounters--there's always a physiological change." Following the morning-long speaker presentations, the participants visited the UC Davis Arboretum Teaching Nursery on Garrod Drive to check out and/or purchase Arboretum All-Stars and other plants, and they toured the Häagen-Dazs Honey Bee Haven, a half-acre bee friendly garden on Bee Biology Road that is under the wing of the UC Davis Department of Entomology and Nematology. The garden is located next to the Harry H. Laidlaw Jr. Honey Bee Research Facility. Among those traveling the longest distance were Lake Tahoe UC Master Gardeners Lynne Broche and Bonnie Turnbull and Turnbull's 14-year-old daughter, Jessie Brown, a junior Master Gardener and an avid insect photographer. 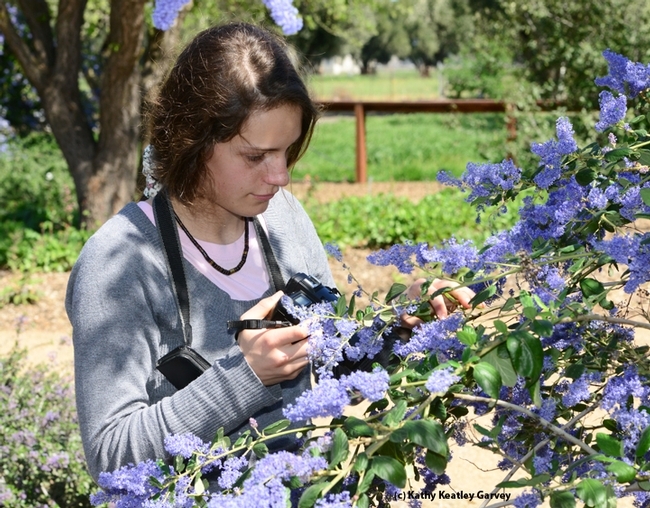 The ceanothus blooming in the haven especially drew the attention of the workshop participants. 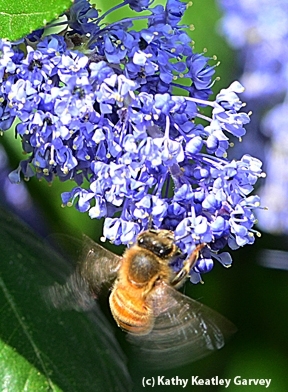 Insects foraging in the ceanothus included two so-called "H bees"--the honey bee and its impostor, the H-marked drone fly. Are all bees effected by the poisonous plants mentioned by Dr. Mussen or just honey bees? I have read that native bees are not effected by California buckeye(Aesculus californica). Extension apiculturist Eric Mussen of the UC Davis Department of Entomology and Nematology says: "My guess: either the native bees that have been in the areas around California buckeye for a long, long time are not poisoned by the pollen or they have been selected (by death of the other genetic types)to avoid the pollen, that eons of natural selection have adapted them to coexist with California buckeye while using their resources." Native pollinator specialist Robbin Thorp, emeritus professor of entomology at UC Davis, says: "We know California buckeye nectar and/or pollen is toxic to honey bees from years of experience with managed hives. Toxicity to native bees and other flower visitors is not so easily determined and to my knowledge has not been investigated. The fact that populations of native bees and butterflies visit California buckeye flowers and continue to persist in areas where the tree is a dominant part of the plant community tends to confirm what Extension apiculturist Eric Mussen says about them. Some good research projects here. So we still do not know if it is the nectar, pollen, or both that may be toxic to honey bees, much less to native flower visitors."